— «Russian street-art», part 1. Published: 2007, in «Objects-2» book. Zachem, Search and upgrade. Photo by Alex Luk, S. Petersburg, 2006.. The modern megapolis is unthinkable without graffiti. Each person, living in the big city and running right along in its environment, daily and everywhere meets numerous graffiti , sprayed on every possible plane and surfaces of the city landscape — results of activity of the street artists, anonymously put in the city area their messages and signs, finished and self-sufficient. Many of these artists are the representatives of graffiti culture, built up in the West as self-dependent subculture trend, reached to date the status of alternative form of modern art. However quite big percent of russian citizens hitherto dispose to think that graffiti culture is an asocial phenomenon, the heritage of criminalized experience of "black" America of 1970—80 th. Moreover, representation roots in mass consciousness about graffiti exclusively as about vandalism (that, in turn, is predefined by the residual effects of soviet mentality — the note of the author). Meanwhile, the majority of European street artists have deviated from such practices and turned their potential to realm of free art. The peculiarity of Russian graffiti culture concludes that it (as, however cultural-economic field as a whole) means an outdated character, in spite of the fact, that nowdays there is a permanent exchange process with foreign information channels. 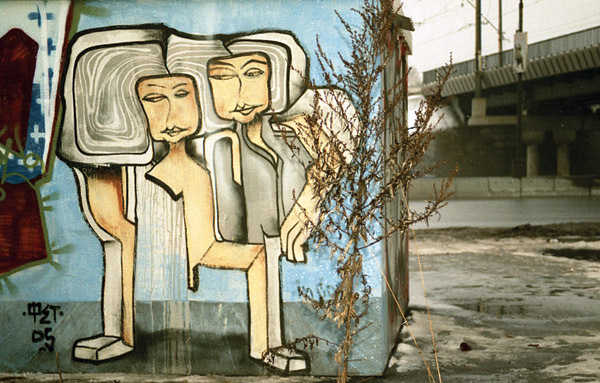 The history of Russian graffiti, marked by the beginning of reformation, has begun in 1985 — concurrently with a fashion on break-dance, dance wonder of the unidentified West. At that time, in the middle of 1980-th, break-dance festivals flashed by over the whole country — from Kaliningrad to Donetsk and St.Petersburg. All this took place under the heavy information crisis conditions. Through friends, visited the USA, were obtained photos, videos, magazines — anything, that was related to a new passion. Thus, feature-documentary films "Wildstyle", "Beat Street" and "Stylewars" formed at soviet youth a concept about hip-hop culture as a symbiosis of three independent concurrent existent cultures: rap music, break-dance and graffiti. 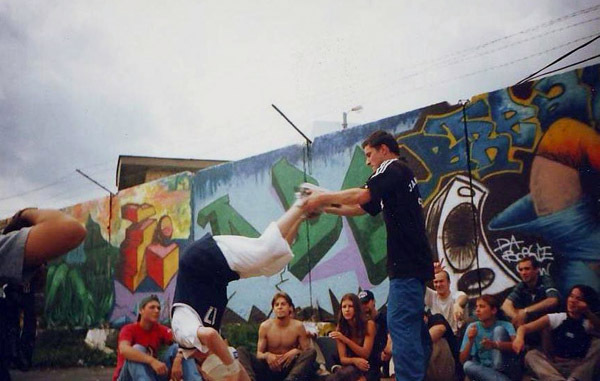 Break dance crew — Da Boogie, 199X. The first dancers, as one of the few, who had an access to information, were also, in that way, the first graffiti writers; by western analogy they designed stages and scenery for their break show. The next 15 years street art development also was provided by different hip-hop groups activity, and hip-hop culture as a whole became the basis of native graffiti school, wittingly define it's development by American model, described by Adam Gopnik and Henry Chelfant and define font as an artistic mean of self-expression (European model of development, at first points also follows an American practice in many cases, turns into conceptual formation side of artistic space). Evolving from simple to complicated, from plain "tags" (stylized inscription, witch contents pen-name of the author) to unreadable tissues "wildstyle" ( the highest level of flexible graffiti language), overloaded by visual effects, emancipated calligraphic conception quite promptly exhausted itself. 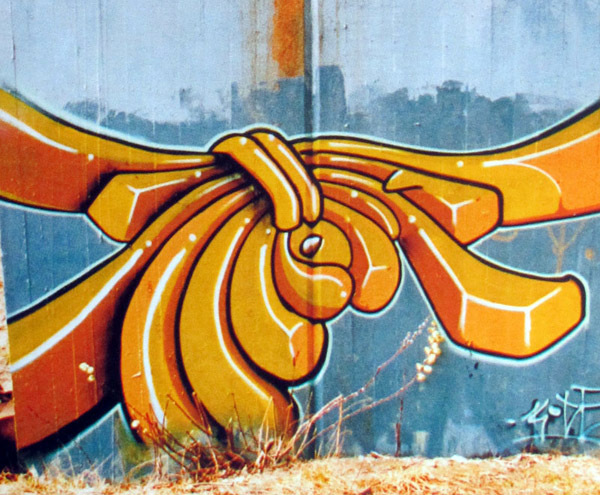 In process of extending graffiti culture worldwide, with each new artist, entered in "mystical brotherhood" of street art there was an increasing necessity for invention of new stylistic forms and techniques with the purpose of the expression of the self among others. Thus, in the beginning of the 90's European successors of culture have gone on a way of change of character of their signatures towards appearance and concrete images. Using the experience of history of the 20'th century coupled with computer and printing technologies , new generation of street artists formed — at first as one of branch of graffiti, and then as self-dependent trend — new subculture tendency, post-graffiti — street art. Street art makes its aim the adaptation of the objects for the urban environment (as usual these objects are stickers, banners or stencils, and also all kinds of installations, sculptures etc...). Just as in graffiti, the artists create his own unique sign, stylized logo — "logo for ego" — and marks it the certain part of a city landscape. And at the same time he not only appropriates the territory, but also dictates its reading to viewer, drags him into a dialogue, simulating different plot programmes. Adapted under the audience perception, image (in contrast to font graffiti gaps) bear in itself the definite emotional charge and semantic loading, legible on the move. For achievement of the most adequate perusal of pawned senses artists quite often resort to the help of a font, similar to the language of comics, sounding or commenting on the image. Inasmuch as the usual stuff merging with street advertising is used, the government doesn't have a necessity to inform them any criminality and to establish any interdiction. Moreover, audience, as the authorities, doesn’t respond to street art as to something asocial (that, besides, is possible to tell about graffiti), even inspire of political appeals and strongly pronounced sexual impulse. On the contrary, street art in a number of cases is social and topical to the limit, expressing the author's reflection on surrounding validity. The messages also may have a multiple-valued perusal, depending on its location. Street art experiments with the environment, and is constructed on game of distinctly traced images with surfaces of buildings on with they are placed and as colliding of contrast images or their accommodation in unusual prospect. The object includes here wall as a part of that should be clearly visible as framing space, graffiti it simply erase. In it the basic differences of street art from more secluded lettering of graffiti culture and co current the cause of its wide circulation. In presented streets of the biggest capitals of the world are covered by thousand pictograms, abstract forms and any sort of characters — logos of sidewalk artists. Almost in every country the original style was already generated. Exception isn't made also by Russia. The development of new disciplines by the Russian artists originally went through neighboring countries — Ukraine and Belorussia and only with development of sociable means got to more independent forms of being. First steps in street art direction were already noticed in the beginning of 2000's, the works of Make, Kto, Code and Fetone were the evidence about that. The last one even invented a personal innovation way of making his sing from color forms, witches were used by other artists before, and witch were overprinted by the authorities afterwards. The first official street art action with Russian artists in the person of "310 squad" were the international projects "Don't Copy Me" and after that "Access", organized by European community "Ekosystem" in 2003. Fet one (310 Squad), Moscow, 2005. At the present moment Russian graffiti industry has turned out on the high-quality level, what is incidental by and large with the advent of professional equipment of the world's leading producers on the market. Actions with European and American graffiti stars have developed this year. Festivals of such kind attract the stimulation of the processes inside of each discipline, reflecting the current state of street art worldwide. However these actions are single-typed and secluded. Positioning graffiti as the interdisciplinary institution, they didn't give an estimate about street art, excluding it from the culture boarders and dooming it to self-development. As a result, street art in Russia remains at the tagging level, while in the West it proceeds to free art field. The majority of artists confused place their clich?s all over; often they don't have any other explanation of their acts, as marking the location they visit. Without a conceptional loading image loses it meaning, peculiar to work of art, turning into a likeness to merchandise mark, brand. There is present evident necessity of proper information upbringing of Russian artists, being in the ideological crisis, the due quantity of corresponding institutions caused by absence. 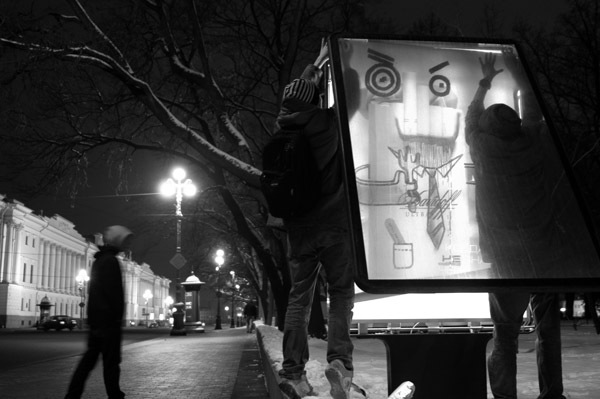 Now the unique body, popularization street art in Russia, maintenance of its information base and the communications, the Internet-portal "Visual Artifacts" (www.visualartifacts.ru), established in 2005. The basic merit of that project is release of the edition "Objects book", devoted to a problematic of street art and illustrating a modern condition of domestic street art. Search and upgrade, S.Petersburg, 2006.